A Fashion Week is not complete without some scandal, gossip and tu-tu – main-main! 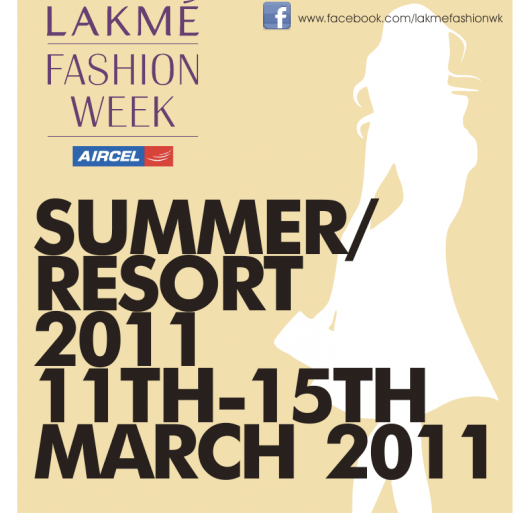 The otherwise bland Lakme Fashion WeeK Summer/Resort 2011 had its share of gossip and scandal on the final day. And where there is Scandal. gossip and fashion 108.168.206.104/~fashions/ is there! The real chatpata incident happened as the Grand Finale show by Guari & Nainika (This is what the trio above was referring to.) was on. Hyderabad based designer Anand Kabra was Tweeting about Gauri and Nainika’s show while watching it and so were a couple of Dolly Auntie Fashion Editors. The comments were definitely derogatory and was in the lines of …“So Valentino…soooo Marchesa…”. In fact I have noticed that our desi fashion scribes are very keen to point out such an such outfit has been ripped off from so an so international designer. It basically is way to show-off that how clued in they are with international fashion. Like I remember wher G&N showcased their spring/summer 2010 collection, some said it’s a rip-off of Marchesa’s Spring 2007 Collection. Why? Simply because both the designs had a rose on the bust? Nobody has a patent on Rose and besides the silhouettes are so different. See the pictures below. By the way, I would like to say that Anand Kabra is a good designer. His sensibilities are different from that of G&N’s but that doesn’t make him bad! 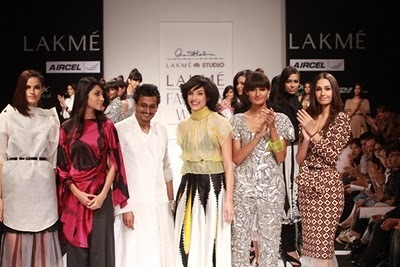 Also I wish Anil Chopra takes the reigns of LFW in his hands and do something to put life back in to LFW. It’s definitely going down and believe you me, it’s got nothing to do with Delhi Vs Mumbai fashion war! arjun sawhney is a small time Pr firm representing all of 4 clients. ofcourse he will defend G&N by all his ways. tomorrow if Anand Kabra or Valentino hire him, he will be rooting for them instead. his method is to insult others, in order to prove his point. Also ..i hav lived in delhi all my life n always felt that it was time wannabe P3P’s got ther due recognition..n viola..look wat u did..u made them superstars overnite…hahaha.. The PR agent is doing his job of fire fighting for his clients, but apparently not so well. Say what you want for Masaba Gupta’s work, but you can’t deny that she has an original voice. The same goes for Anand Kabra, who is indeed a very good designer and seems to get stronger every season. 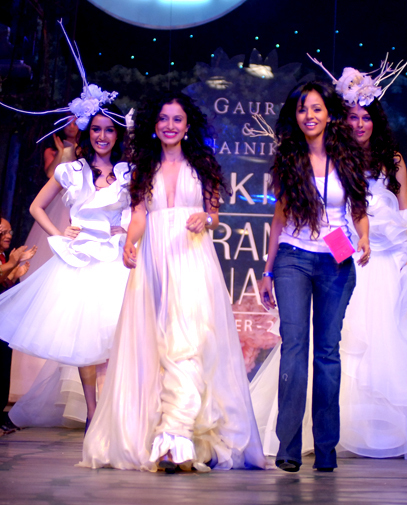 Seeing that Gauri & Nainika get to have a finale show would rile some other designers, clearly their styles are inspired. There is no patent on using rosettes or ruffles in a certain way, but the least they could do is show some uniqueness in design, if not out and out innovation. A lot of Lebanese designers say that they are inspired by European fashion, and that’s how they started out, but they didn’t emulate to the extent of making subtle copies or half references. They took cues and created something surreptitiously beautiful in the process, and now they are known for their affordable couture. Gauri & Nainika need to put in a little more effort to cleverly highlight their use of feminine flourishes. I just want to tell you that I am new to blogging and site-building and seriously enjoyed this blog site. Most likely I’m likely to bookmark your blog post . You certainly have perfect posts. Thanks a bunch for sharing with us your website. @ Jack Lakme as a brand has been in maximum benefits of its property Lakme Fashion Week since it started has banked on it as a cosmetic brand, growth of the brand from the day fashion week started in India and now. lakme has always tried to get maximum value out of it keeping the real focus fashion aside as IMG the world leader in organizing fashion weeks across the globe, Now Lakme keenly looks in the designers show celeb quotient. If Nchiket gets Mr Bachchan to see his show (as his father is a doctor to mr bachchan in an obligation).hence Nachiket is a good designer and eligible for a jury to select the Models fr the forth coming fashion week, as lakme had its value in return(give n take)now this season sudden fall in celeb invation media looked little un interested plus the world cup fever guess like fdci Lakme should have done their dates better,now Mrs Anupama Dayal gets an award best designer of the year( thanks to dolly aunty reporters) who like designs as ( hole in a bed sheet ) all u need is belt to tie at the waist,priya kataria puri?gosh. is as good as sanjana john show. where you came to see salman who gives a damn abt cloths will never have to use thm ne way. Jack congrats ! the whole one page article on this story, you made it boss, Masaba apologizing and puts it as bad humor, kabra defends and says eligible since he is ten seasons old to comment and his expert critic still hold a chance, wonder where they learned there fashion from. your work should prove your worth, heads of to manish Arora and how ! !